As the first general body meeting of the spring 2014 semester, the new board was introduced to the general body. You can check out the bios of the new board on the BWUA website. Interviewing season is well under way, so we found it fitting that our first GBM focus on recruiting and interviewing tips. BWUA members participated in a heated game of family feud with several questions related to campus resources, interviewing skills, and follow-up advice. The top answers were based on information provided by Career Services. 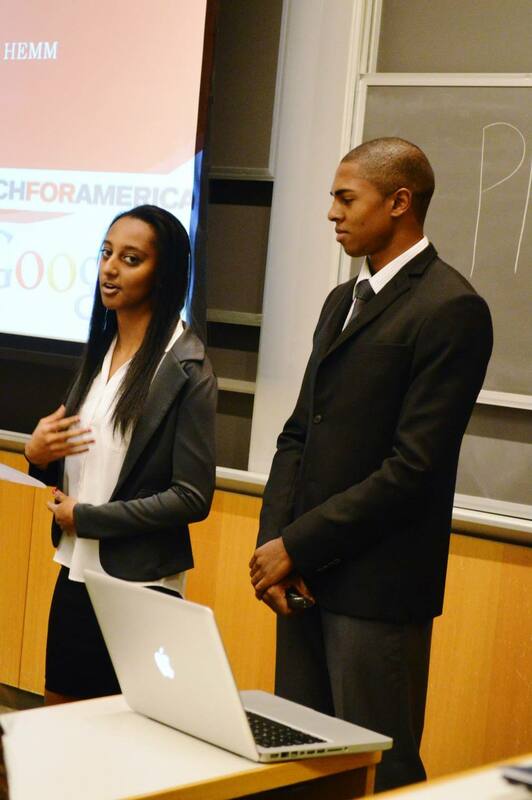 Members were also given the opportunity join different committees to increase their involvement within Black Wharton. Various committees can be found within marketing, community service, HEMM conference planning and with the freshman liaison. Seniors who have already secured work opportunities upon graduation attended the GBM to offer more insight on interview tips and tricks. Baltimore Crab & Seafood catered Tuesday's event. March 18th at 7:30 pm. and add us on Facebook to stay updated on upcoming events such as study breaks and tutoring sessions. On October 22nd, 2013, students from the Penn community gathered how to better present themselves both physically and online at our 2nd GBM of the semester, Building Your Personal Brand. Led by Makini Hughes and Keishawn Johnson, students learned how to craft the perfect elevator pitch, and how your culture defines you. Those in attendance then examined the importance of building a personally brand through various new outlets. Academically, students are encouraged to excel in their studies and to develop strong relationships with the professor as both aspects help students in finding internships during the summer. In the online world, students were encouraged to create LinkedIn profiles in order to access a professional social network. Additionally, students are encouraged to monitor all social media such as Twitter and Facebook while applying privacy settings as employers constantly search social media during the application process. After great dialogue about building a personal brand, interacting with other students delivering elevator pitches, and enjoying a great meal from Pattaya, the BWUA Director of Community Service, Kerubo Mokaya spoke about the U.S. Dream Academy, featured at our first GBM, and encouraged students to become more involved with their mentorship program for children in Philadelphia. Thank you all for coming! We hope to see you at the next GBM in November! At long last, BWUA held its first General Body Meeting of the 2013-2014 academic school year called, "Internship Panel - What Did We Do Last Summer?" On September 24th, 2013, 80 students gathered in John M. Huntsman Hall for this meeting, led by the two sophomores of the BWUA Appointed Board, Lena Hairadin and Chad Payne. Wharton Vice Dean Rosenkopf gave a warm welcome to those in attendance on behalf of the Wharton School. She encouraged all students to take advantage of Wharton opportunities, and spoke about how excited she was for this new year. Following her presentation, Scott Romeika, Director of Academic Advising at the Wharton School, gave an an in-depth presentation of Wharton and Penn's academic advising. He then encouraged the freshmen to be ambitious, hoped the sophomores and juniors enjoy Wharton's core classes, and encouraged seniors to come by G95, and, most importantly, to enjoy their final year at Penn. The presenters then moved away from the Wharton School as we heard Naaila Gray speak on behalf of the U.S. Dream Academy. Last year, at the Black Wharton Gala event, we honored the U.S. Dream Academy, and now we hoped to continue that partnership throughout the year. Naaila introduced a new mentorship program with Penn for elementary school students in Philadelphia, and highly encouraged BWUA members to participate in this rewarding experience. Lena and Chad then began to speak more about BWUA, introducing the executive and appointed board while speaking about events that we provide during the year. Those in attendance then enjoyed a meal catered by Baltimore Crab as they learned how to become involved with BWUA through the Marketing, Alumni Relations, and HEMM Committees. They were asked about their internship as a whole, what role they, how they came about acquiring it, as well as their greatest and worst moments during the internship. Following the panel, BWUA members stuck around to ask our panelist and Board members questions. The event as a whole was a great success and showing! We hope to see you at our next GBM on October 22nd, 2013! On March 20th, 2013, students learned how to transform their ideas into a reality through entrepreneurship. In collaboration with the Black Student League, BSL, the Black Wharton Undergraduate Association hosted 3 entrepreneurs, Kesi Gibson, Amarachi Enwereuzor, and Daniel White, as well as the moderator, Marvis Burns, in a panel discussion about entrepreneurship. Each of our guests brought forth an interesting perspective on the subject. Together, they explained that students should embrace the opportunities that follow them after graduation, to use each opportunity to help them to develop a strong business skill set, and make smart business decisions. Nonetheless, the conversation between the panelist and the audience led to 3 powerful statements. The first from Enwereuzor who said, "Roll where you are planted." This lesson meant that if you ever feel like you are just a number or no one is helping you become succeed, you are more likely to leave that environment. The second quote was from White who said, "You can't build a sandcastle without wondering where the tides come in." White was inferring to the fact that no idea is unique and therefore you should be vocal and execute your idea to the best of your abilities. The final quote, which was repeated multiple times by our panelists, was, "Pursue your passion." They then explained that your passion was your commitment to your goals. You should not be afraid to test your abilities or seek out mentors to give you guidance. Also, its never a good idea to do what everyone else is doing: do what pushes you. The session ended with members asking panelists question over pizza from Allegro's Pizza. If you have an interest in entrepreneurship, or any additional questions, please feel free to contact our panelists and moderator by email. 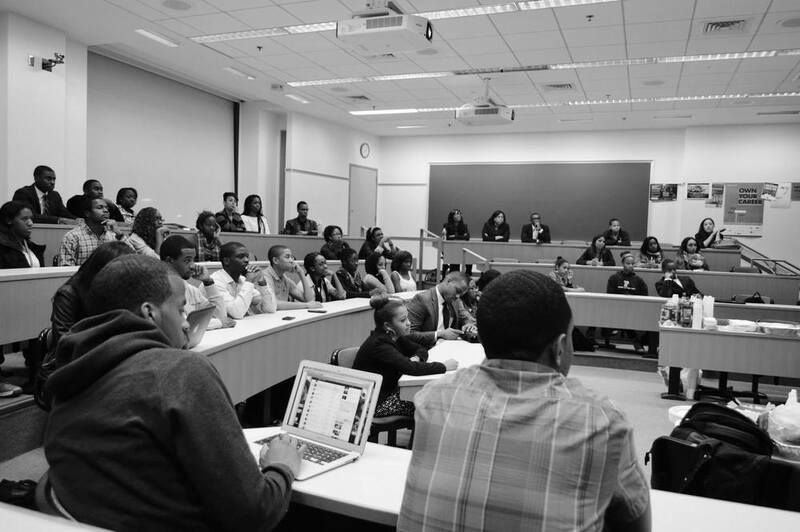 On February 26th, 2013, forty members of the Black Wharton Undergraduate Association gathered to hear realistic advice on what it truly means to be an African-American in the business world. Guided by University of Pennsylvania professor, Guthrie P. Ramsey, students listened attentively to a panel of successful individuals from Pennsylvania. This included Brittany Jean-Baptiste, Class of 2010 of Penn State University and Employee Engagement and Inclusion Coordinator at Comcast; Alan-Michael Hill, Class of 2011 of the University of Pennsylvania and First-Year Law student at Penn Law; and Luke Chernosky, Graduate of Cornell University and MBA Candidate at the Wharton School Class of 2014. As our members indulged in Chipotle, they listened attentively to advice from our panelists. First, students learned how to present themselves both physically and online as companies are actively looking for well-presented and responsible employees. Members also became actively involved in our discussion of discrimination in the workforce. Our panelist unfortunately and unanimously agreed that there was racism in the workforce; however, they also provided the audience of students with ways to combat it. Hill supported that simply putting one's head down and working harder than one's coworkers allows one to produce a greater product and later gain superiority. Meanwhile, Chernosky supported that today's generation is now competing against people all across the world, and that minority students must take advantage of the opportunities that await them in African countries. In addition, both Hill and Chernosky believed that one should look to friend people who are similar to them, whether its height or skin tone; however, one cannot forget that though they are an ally, they are also your competition. Furthermore, Jean-Baptiste eluded to confronting those who were disrespectful by asking them to elaborate when they question your work, or wishing that they had not disrupted you during a speech as their question would have been answered later in the presentation. Ramsey then brought the discussion to a close as our members applauded the panelists and waited to ask them further questions individually. BWUA Freshman member, Rachel Palmer, said, "It was great! The moderator was quirky and the panelists were interesting and insightful." Our members left the GBM feeling educated about the hidden truths of the business world. Nonetheless, the panelists inspired the students to continue working hard in school, and sparked the confidence to overcome all barriers in the work force. Yesterday, the Black Wharton Undergraduate Association kicked-off the new year with its first general body meeting of the spring semester! The meeting focused on introducing the organization to the appointed and executive board members, and helping members prepare for interviews with an “Acing the Interview Process” themed game of Jeopardy. The Board also introduced their new goals for the semester, which include improving professional development by diversifying corporate sponsors, increasing member participation in community service, creating a test bank to help members academically, and holding more social events throughout the year to market the BWUA family brand. After the newly elected club President, Paul Ampofo, spoke about his excitement for the year, the 50 BWUA members in attendance enjoyed a meal from Baby Blues BBQ, featuring ribs, BBQ chicken, macaroni and cheese, and apple cobbler. As members conversed with one another, Ampofo and the newly appointed Director of Membership, Ike Onyeador, led everyone in a game of Jeopardy, focused on teaching members about the Dos and Don'ts of the interview process. Members were split into 4 teams, each with a captain who acted as the team's speaker during the competitive game that tested one's knowledge of interviews. BWUA member and captain of the winning team, Kwadwo Agyapong, said, "The game was a cool and on an engaging topic. The food was amazing and, Overall, it was a great event to start off the year!" As the meeting came to a close, the winning team celebrated with BWUA t-shirts and water bottles as members socialized and learned about becoming involved with Black Wharton through the Marketing, Finance, Membership, Freshman, and Community Service Committees. This week BWUA hosted a summer internship panel led by Vice President of Internal Relations Paul Ampofo. The Panelists included Robbie Dixon, BWUA director of marketing Lizzi Diggs, Chris Russell, Joivannah Childs, Alex Emanuel. Each of the five panelists was a specialist in a different area; Robbie in investment management, Lizzi Diggs, Chris Russell, and Alex Emmanuel in law, and Joivannah Childs in marketing. The panelists each spoke to their own experiences, baring how they had arrived at their positions and giving younger members poignant advice based on their successes and minor regrets. Across the panelists, one of the major takeaways were the opportunities available to undergrads who excelled in their first internship. “There are many other smart students there,” Investment Management panelist Robbie Dixon,” and you want to show the firm that you stand out and they need to ask you to return.” Marketing panelist Joviannah Childs had a testimony that truly embodied this idea. For her sophomore summer, she had the option of working in finance at name brand Colgate or pursuing her true passion of marketing lesser known Modells. While she adamantly did not want a career in finance, she choose to take the Colgate offer given the better name and hoped that she could later transfer to marketing. After a stellar summer, Joivannah was able to approach her Managing Director and request a switch to the marketing side of Colgate. “This has never been done before,” he told her and while there was a substantial amount of pushback at the beginning, Joivannah was eventually able to get the position she had been wanting. As she said, “I was only able to do that because I had shown that I produced strong work. Because I had shown I was competent and dependable, they were willing to give me a chance in marketing. Joivannah’s story highlights the main theme of the GBM: members’ possibilities are endless, they only thing required of them is to put in the hard work. This Tuesday BWUA hosted its second GBM of the year hosted by Director of Professional Development Titi Oshinayo and Director of Marketing Lizzi Digs. This GBM saw great success with a strong turn out of students from all years. The presentation had two features, one being the importance of crafting your online presence with care and the other staying ahead of the curve academically. Titi emphasized the importance that real companies place on student’s online profiles and gave examples of the dangers of becoming too personal online. In a creative game, the hosts told the membership of a young public school teacher who had been fired for posting inappropriate pictures on Facebook. The membership erupted into discussion on what they felt was that the picture must be. “She must have been in a club somewhere,” one member exclaimed. In the words of another student “It must have been a photo of an inappropriate relationship with a student.” Titi and Lizzie smiled as they revealed the picture. It turned out to be a docile picture of a woman smiling with two glasses of wine in her hands. There was uproar from the memberships. “People were upset because she was an adult who appeared to be enjoying her wine responsibly, “explained Lizze. “However,” as Titi continued,” it simply goes to show that even if something is technically alright employers can still draw their own conclusions and it can have consequences for you.” From there our hosts moved nicely into the discussion on how BWUA members can remain ahead of the curve academically. Titi and Lizie reminded members of University resources like Wine Garden and the Tutoring Center at Penn and spoke to the process of getting involved in both of these. The two directors stressed the importance of tutoring, and recognizing that asking for help was not a sign of weakness. Furthermore, the ladies encouraged members to seek help early in the semester, as this is the time when there is the most possibility for improvement of their grade. In sum, the GBM was incredibly informative. Members would be wise to heed the advice, as those who put the advice into practice will see incredibly positive results in the future. The last GBM was expectedly bittersweet. On a bright note, the meeting coincided President Tingle’s birthday so BWUA was able to help him celebrate, however, it was also the last GBM for graduating seniors. Historian Ashimedua Okonneh and VP of External Relations Oyinda Adeofie partnered to host the meeting, which was centered around maximizing your summer internship. Ashimedua and Oyinda took turns offering tips for how to find the best success in summer internships, with key and often overlooked pointers on what to do both before and after the internship. One of the biggest pieces of advice was that members should adequately research the firm they are to be working for as well as to have a full understanding of their role as an intern. Also notable was the fact that members were encouraged to remain cognizant of the reputation they were creating for themselves. Oyinda and Ashimedua warned against involving oneself with office gossip or overusing personal email and texting, as both could actions could be negatively perceived. Finally, the hosts reminded the members that they should stay current with their firm after finishing the internship, especially if they one hope to return to that firm in a future summer or stay within that same industry. Coupled with the advice were hypothetical situations with an interactive component. The hosts first polled the membership on what they would do in the event that they had booked a vacation before the internship dates were made clear to them. The room was generally in agreement, with almost everyone saying that given that the internship should still take priority to the vacation. There was more discussion with the second hypothetical, in which one had to decide how to handle conflicting assignments from two different supervisors. While most people said that they would hope they would have a strong enough relationship with one of the supervisors to ask for an extension, others suggested contracting a fellow intern to help them complete the assignment. Finally, the last hypothetical asked what do in the event that you have a return offer but you are considering switching industries. Seniors Quasie and Balfe responded that it would be important to be sure that there are opportunities in the industry you are thinking of switching to before rescinding the current offer. After the internship presentation, the meeting transitioned into dinner, and from there current events. Ashimedua presented on the Philadelphia Flyers/Pittsburg Penguins series, as well as the latest developments in the case against George Zimmerman. From there, Oyinda returned and the two presented BWUA: A Year At a Glance, in which they highlighted HEMM, GALA, and the other numerous activities and events the club hosted this academic year. Then came the moment all had been waiting for: Senior Appreciation! Those honored were: Ex President Triston Francis, Ex VP of Internal Relations Balfe Morrison, Ex VP of External Relations Oyinkansola Ayobiojo, Ex Marketing Chair Quasie Jones, Ex Marketing Chair Brooke Hinton Ex Treasurer Tobi Obegunde, Ex HEMM Co-Chair Ruth Gillis-Harry, Ex Director of Professional Development Dave Thomas, and finally Ex Social Chair Joseph Smalls-Mantey. After a hearty round of applause for the seniors who have meant so much to BWUA, the board closed the meeing by surprising Jarrid with cake for his 21st birthday!